The Royals affiliates went 2-3 on Thursday night. The Naturals Foster Griffin settled down after giving up back to back home runs in the second inning and kept his club in the game before being rewarded later. The lefty was highly efficient after the two home runs, working eight innings on just 90 pitches while retiring 13 of the final 14 hitters he would face before being lifted for Richard Lovelady. Trailing 2-1 into the eighth inning, the Naturals rewarded their starters quality work by getting a pair of RBI singles by Jack Lopez and Samir Duenez to take the lead. 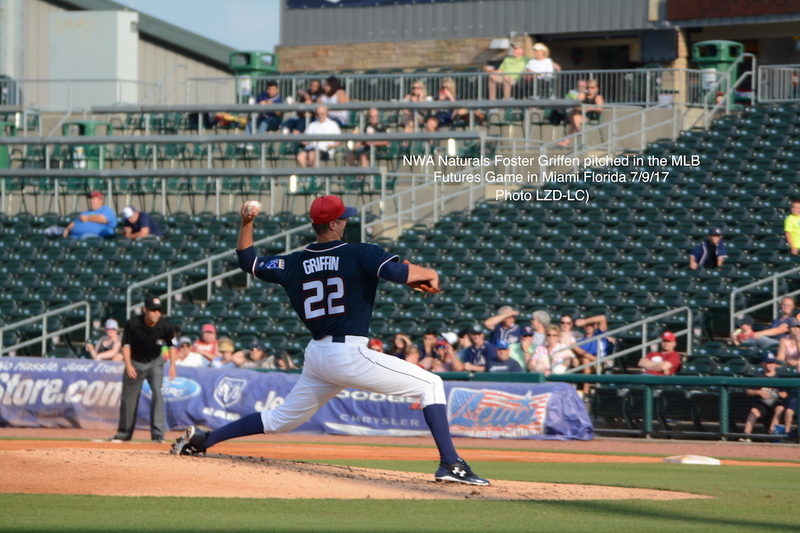 After Griffin made that lead stand up in his half of the eighth, the Naturals gave the bullpen some cushion when Lopez and Ryan O’Hearn hit back to back home runs in the ninth to put the game out of reach. The win for Griffin was his 15th of the season. That equals Jake Odorizzi’s 2012 and Rowdy Hardy’s 2007 season for the most by a minor league pitcher during the Dayton Moore era. The Blue Rocks received 10 innings of shutout pitching but couldn’t do anything with it before falling in the twelfth on Thursday night. Starting pitcher Colin Rodgers gave Wilmington six shutout innings to start this one, working around five hits and a pair of walks before leaving. 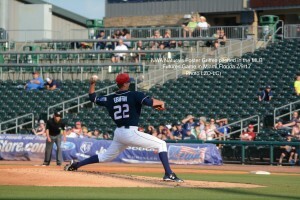 His bullpen mate Franco Terrero kept the zeroes going, allowing just three hits in his three innings. While those two were working shutout baseball, the Rangers affiliate had a starter blank Wilmington for eight and one-third innings as Steven Bruce struck out seven and didn’t walk one while working around six Blue Rocks singles. Tied after eleven innings, lefty reliever Justin Camp gave up a two out RBI single to give the Wood Ducks the lead before the Rocks went down 1-2-3 to take the loss. The Chukars offense turned a 3-0 deficit into a 7-3 lead with a pair of multi-run innings to take control of the game versus the Rockies rookie league team. A five run third inning did the majority of the damage as Idaho Falls piled up four hits to go with a walk and a Rockies error. The big hits in the inning were a pair of doubles by Amalani Fukofuka and Freddy Fermin that scored three of the five Chukar runs. Starter Julio Pinto gave the team six innings of four run ball while Idaho Falls continued to pile on, scoring four more runs including a three run sixth inning that featured a Fukofuka rbi triple to put the game well in hand. Starter Andres Sotillet’s struggles continued as the 20-year-old Venezuelan right-handed starter gave up six hits, one walk, and six runs in just one and one-third innings to take his second loss decision for Burlington. That hole was just too large for the offense to overcome and the Pirates tacked on a couple insurance runs to put the game further out of reach while the Royals fell 10 games below .500. The Royals 2017 2nd round pick Evan Steele made his fifth start since joining the organization, working another two innings. The lefty gave up one hit in the first inning before allowing three runs when he gave up a home run, a single and a triple after plunking a hitter. On the bright side, Steele did strikeout three hitters to give him 16 K’s in just eight innings of work. Lefty Marlin Willis followed with three innings of his own, allowing a run on four hits while helping create six groundouts. Coming into this start Willis had a 60 percent groundball rate and he did nothing to change that in this one with eight of the 10 balls contacted off him ending up in groundballs. While the two lefties gave up four combined runs the Dodgers pitching limited the Royals to just five hits with the only run coming via MJ Melendez’s fourth home run of the year.